Based in Gujarat, India, SRGE is the most reliable name when it comes to Air Compressor Parts! Available with us in different specifications, our Parts have no match in the market. We also manage a large stock for furnishing urgent and massive demands at a time. Buyers are free to place orders, timely deliveries of the same are our topmost priority. Air Filter : SRGE is leading supplier of 100% original, compatible & replacement air filter for rotary screw compressor for various brands like Aerzen, Atlas Copco, Elgi, Ingersoll Rand, Kirloskar Pneumatic, Boge and all the leading brands. Oil Filter : We are leading supplier of 100% original, compatible & replacement oil filter for rotary screw compressor for various brands like Aerzen, Atlas Copco, Elgi, Ingersoll Rand, Kirloskar Pneumatic, Boge and all the leading brands with life, performance and fitment assurance. These screw compressor oil filter is essential for enhancing longevity and performance of screw compressors. 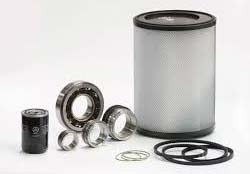 Oil filters which remove contaminants from oil and ensure proper safety of machinery. We offer the screw compressor oil filters for all leading screw compressor manufacturers. Air Compressor Bearing and Sealings : We are suppliers of genuine bearing kits and sealing kit for Aerzen, Atlas Copco, Kaeser, Elgi, Ingersoll Rand etc. oil free and oil lubricated compressors. Air Compressor Oil : We are leading suppliers of compressor oil for Aerzen, Atlas Copco, Kaeser, Elgi, Ingersoll Rand etc. We supply replacement Delta lube (Aerzen), sigma fluid, roto inject oil, rotoxtend fluid, etc. Our business philosophy is “Customer First, Innovation Oriented.” We are a team of technical and experienced personnel having a good understanding about the quality and industrial requirements. Our business objective is continuously improve product with speciality, suitability and superiority. We would wish to establish the business relations with the customers worldwide. To provide you with quality products and sincere services and you have in common the creation of wealth. Our products are demanded in Electrical, Electronic and Mechanical Industries. We are distributors of products of International Electrochemical Company (IECCO). Our major markets are USA, Africa, European Union, Middle East and South East Asia. Integrated with excellent management efficiency and widespread business network, the company has been successful in elevating its status as a brand synonymous with trust and reliability. Quality is our passion and we measure our Success in terms of Customer Satisfaction.